You are here: Home / PC Repair / What Are the Benefits of Having Multiple Monitors? What Are the Benefits of Having Multiple Monitors? 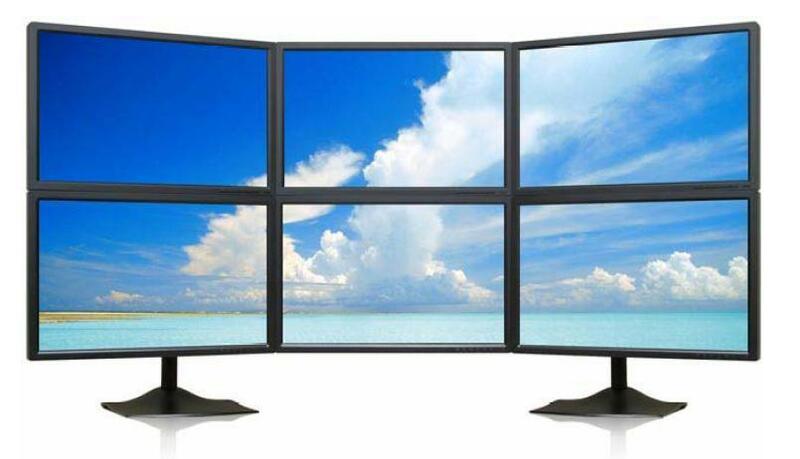 There are now many individuals who are using multiple monitors in their homes and offices. In fact, there are now lots of products available that promote this type of computer operation. This trend seems to know no boundaries because many different kinds of people, including business executives and gaming enthusiasts, are taking the plunge and adding more screens to their setups. When it comes down to the reasons why so many people are deciding to pursue this option, it is because of two main factors: enhanced abilities to run multiple programs and increases in productivity. The main reason why most people are using multiple screens is because they make running two programs much easier. This is because you can dedicate a different screen to each task. With this type of increased ability, running two programs at once is not as difficult. The most common way that two programs are used involve jobs that revolve around a central task and also require that other programs or documents be instantly accessible for reference. The end result of these multi-tasking endeavors is greater productivity. At the beginning of this century, there was a landmark study performed in Utah that found that multiple screens increase productivity. The results were staggering. There were notable improvements in every single category that was tested. However, there was another study that also came up with similar results. This study also discovered that participants clicked the mouse fewer times and were able to switch screens more effectively when they used a multiple monitor set up. There are many ways to create better ergonomics with a multiple monitor layout. However, although you can establish basic guidelines about the best way to accomplish this, each situation is going to be different. Many solutions involve assigning a central monitor for most tasks and then assigning other monitors to additional jobs that do not need constant attention but require that a program be allowed to run continuously. Examples of this would include devoting a monitor to an email account or letting Skype run constantly on its own monitor. Another way that many users employ multiple screens is to use one or more monitors as one large screen instead of one that is split. The option is particular popular with gaming enthusiasts. The evidence is overwhelming, and the verdict is in. Multiple monitors are very good. They are good for productivity and they are good for business. They help individuals get the most out of their computers by increasing the amount of visual display options. In the not-so-distant future, having more than one monitor will be the norm and not the exception, so it might be prudent to go ahead and buy additional monitors, especially now that the prices of new monitors have dropped substantially in the last few years. You should always remember that if you need help with setup up such a configuration, just ask a computer repair tech to provide you with assistance.